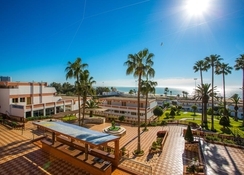 Set opposite a private sandy beach, the 4-star Club Almoggar Garden Beach hotel makes for a great stay in the heart of Agadir, Morocco. The hotel comprises two inviting swimming pools, a fitness center and spa, where the guests can maintain their fitness level and stay pampered with rejuvenating massages. Each of the guestrooms and apartments in the hotel are air-conditioned, featuring a balcony plus standard in-room amenities to ensure a comfortable stay is had. The on-site restaurant serves up buffet-style meals, where guests can enjoy an alfresco breakfast on the scenic hotel terrace – outside of the resort there are plenty of eateries nearby to indulge in. Spend time on the sandy beach, make a splash in the freshwater pool or wander the resorts bustling promenade and soak up the local scenery. 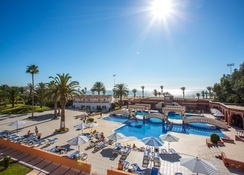 Club Almoggar Garden Beach hotel boasts a great location, opposite a private stretch of sandy beach. Golf lovers can tee off at the Ocean Golf course, which is 7km away. Agadir –Al Massira Airport is the closest airport, at 24.7km away from the hotel. 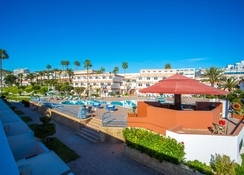 Club Almoggar Garden Beach features air-conditioned rooms with a balcony or terrace offering stunning views of the sea. The room types are available in several categories to accommodate solo travelers, couples, families and group of friends. All of the rooms are furnished with single beds or a double bed, sofa sets in the living room, wardrobe, dining table, kettle, tableware, safe, TV with satellite channels, telephone, en-suite bathrooms and much more. The hotel serves up a buffet-style breakfast to its guests each morning on the rooftop terrace. 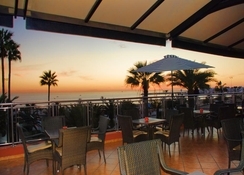 Additionally, there are a selection of restaurants worth visitng just outside the hotel and along the popular promenade, some of them include Bollywood (Indian), Herguita (Moroccan), Pure Passion Restaurant (Mediterranean and European) and more. 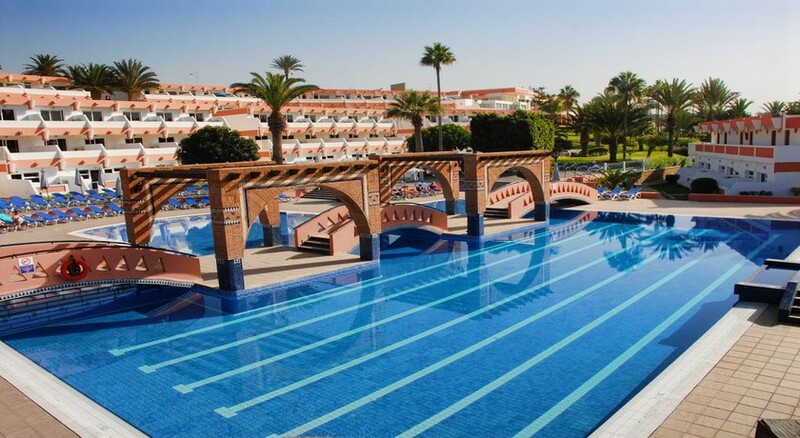 Club Almoggar Garden Beach facilities include two freshwater swimming pools equipped with sun loungers for those who like to relax. A luxury spa and wellness center, gym and plenty of sports and leisure activities including watersports fun, kids clubs’, mini golf and more. As the hotel has its own private stretch of beach, it's a fantastic spot for those that like to be beside the sea. cheapest on net...facilities are good staff are polite and it's huge. walk out of back door and you are 20 ft away from beach...small walking distance away from Marina. do ask to get room.upgrade it might cost you small amount of mony but results are great. Great place really close to the beach front. Gym and house keeping could do with serious upgrade. We had an amazing week's holiday. So close to the beach, professional staff, when we had a water leak in the bathroom, they quickly tried to rectify the problem and promptly helped us move to an upgraded room. Food, room, pools, gym, Hamam, etc were way above expectations. Stayed for a week at May half term and had a great time, the hotel is close to everything, a pleasant stroll along the beach road will take you everywhere you want to be, the hotel was great, good pool and pleasant staff and clean. The food at breakfast was good eggs cooked to order and a good selection at the buffet table, could do with a bit more fruit though but overall a good place to stay. Best location. Staff very friendly and helpful . Good value for money.